We're back. The tedium of the international break is over and we now begin the final two month stretch of the season. Liverpool are entering a tricky spell with away league games and not to mention the Champions League semi final 1st and 2nd legs within the next fortnight. And first up in this Easter period is a tricky trip to Crystal Palace. Despite their league position and avian looking manager, Palace have been one of Liverpool's bogey teams in recent Premier League history. They have beaten the reds five times in the 17 Premier League meetings, with Palace enjoying a number of notable wins especially at Anfield in recent years. The 3-3 here at Selhurst Park in 2014 was particularly notable for arguably being the moment that any chance of the title was extinguished. Let us guide you through the first Premier League game of the weekend, and obviously to us Liverpool supporters the most important. But Andy Robertson has shaken off his international dead leg, and Nathaniel Clyne could be in line for a return after missing the season to date. Palace themselves have some injury worries - Connor Whickham, James Tomkins and possibly Wilfried Zaha could all miss out today. We'll find out very soon. Liverpool are currently third in the Premier League table, on 63 points, but we have played a game more than any other side in the top 8. A win today will move us up into 2nd temporarily at least - with Man United kicking off at 3pm at home v Swansea. Chelsea host Spurs tomorrow afternoon - which will be an important game in the race for the top four positions in the Premier League. Nathaniel Clyne is back in the Liverpool squad for the first time - he's on the bench. Two changes - Alexander-Arnold and Milner replace Gomez and Emre Can. 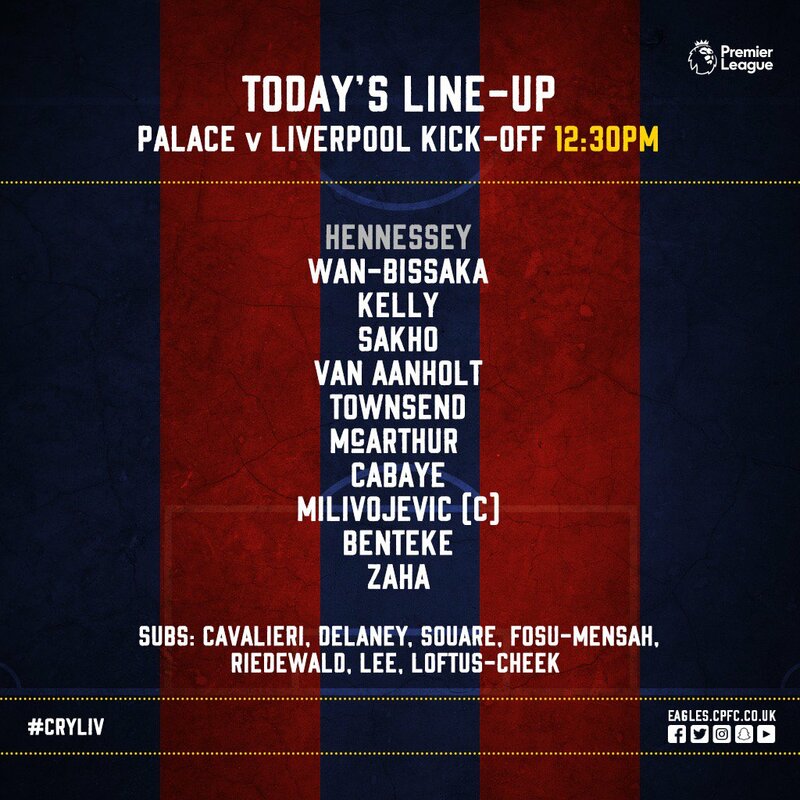 As well as Hodgson in the managers seat, Mamadou Sakho, Martin Kelly and Christian Benteke in the starting XI, Palace also have Diego Cavalieri as their sub keeper today. This must be how it feels for Southampton fans when they play us. Except we took their 'better' individuals. Today's game is Klopp's 100th Premier League game for the reds. A win would make it 54 wins in his first 100. This would be lower than Benitez's first 100 (56 wins) but higher than Rodgers (53 wins) - however Klopp's Liverpool are much tougher to beat. Rafa lost 26 of his first 100, whilst Rodgers lost 22. Loris Karius making his 10th consecutive appearance after dislodging Simon Mignolet from the first team. 'It took me a bit longer but I'm really enjoying it now. It's not easy for a keeper to come in and come out but if you get a game once in a while you feel you need to show something special - maybe it's more pressure." The players are on the pitch - there were handshakes for Mamadou Sakho and his former teammates in the tunnel. Liverpool in the white and green piped away strip today. We're underway at Selhurst Park! Let's do this redmen! 5' High line from Liverpool's forwards in these early stages. Firmino has attempted to close down a goalkeepers kick and Wan-Bissaka has cut out a promising LFC attack. 10' Wilfried Zaha and Trent Alexander-Arnold have a tangle after a long ball upfield from Palace. Play on. 10' Robertson tries to play a through ball behind the Palace defence but it's cut out by the five man defence. LFC have a corner here..
11' Van Dijk connects his head from the corner but it goes wide. 12' Penalty to Crystal Palace. Karius concedes it fouling Zaha - yellow card. Zaha had broken through the defence and Karius clattered into him. GOAL - Luka Milivojevic makes it 1-0 from the spot. 18' Liverpool just haven't got going here yet. Henderson/Milner midfield at times just doesn't look inventive enough. Not much supply to the ammunition up front and now Liverpool have to come from behind. Penalty not given for LFC. 23' Looked a foul on Sadio Mane - not a penalty and a yellow card for a dive. LFC fans don't like that decision. Replays show it was a penalty. 28' Alexander-Arnold finds Salah who twists and turns in the area but drills the ball straight at Hennessey. Liverpool have another corner now though. 30' Milner corner - Mane puts it in the net. Not given. Offside says the officials. Firmino was actually getting his shirt pulled at the time. 38' Benteke gets a yellow card for a cynical trip on Virgil van Dijk. Those two have had a couple of tussles. And now van Dijk appears to have a possible knock with another Benteke clash. 41' Good angled shot from Salah and Hennessey is called into action to save that. 43' Liverpool racking up the corner count in this half. Another one incoming now. Liverpool have been the better side since Palace scored but the home team may think that goal will be enough. Salah corner comes on and Hennessey saves again from the flick on. Palace 1-0 up with their penalty, Liverpool denied a penalty and have had a goal ruled out for offside. The reds passing has been poor although we have had the majority of chances in the game. Lots of work for Liverpool to do now. Liverpool are back out for the second half and haven't changed into their orange kits, sadly. 49' EQUALISER - Sadio Mane with the goal. Good build up by the reds - Mane puts the ball in from a Robertson drilled pass. 54' It's a much more adventurous second half. Palace are piling men behind the ball. Great cross by Andy Robertson - but there's nobody at the back post to put it away. 57' Two huge chances missed by Benteke. Sloppy by Milner first chance, sloppy by Van Dijk second time. Liverpool got lucky there. 62' Strange scenes as Palace get a bizarre free kick outside our area. But when it's finally taken Karius makes a great save. 64' Oxlade Chamberlain and Adam Lallana are on. Off goes Sadio Mane and Gini Wijnaldum. Some protection there for Mane who was on a yellow card. ... Adam Lallana. Kind of a nothing challenge really but he is going off just minutes after coming on. He's limping off anyway - stretcher not required. 78' Scramble from Palace to survive a Salah/Firmino double attempt. Game reaching it's closing stages but both teams looking to get the match winner. 83' Shot drilled over the bar by Alexander Arnold after a good chase from Firmino to win the ball back. 84' MOHAMMED LORD KING EMPEROR PHAROAH SALAH!!! SCORES! The ball makes it way to Salah who is at the edge of the six yard box in space - why would Palace let that happen - 29th League goal of the season! 90+2 We're into the final 4 minutes of added time. The reds have done it the difficult way, but won through thanks to goals by Sadio Mane and Mo Salah - that was Salah's 37th Liverpool goal this season. Liverpool move into second place and can now prepare for the Champions League semi final.